There are a lot of things working damn hard to make life stressful. Work. Politics. The Cleveland Cavaliers. McDonald's not re-releasing Szechuan sauce. However, stress is not evenly distributed across the United States. At least, that's the contention from WalletHub, the same company who last year created a list of the least stressed cities in the United States. The company has applied some of those same principles to determine the most and least stressed states in the U.S. The upper Midwest fared well, claiming the four least-stressed states. Topping that pile was Minnesota. It must be all those lakes to chill at, as well as never having the expectation that a sports team will win a championship. Vikings lost again? No big deal, that's how it's always going to be. At the other end of the spectrum, a trio of adjacent states in the south are America's hub for tooth-grinding levels of stress. 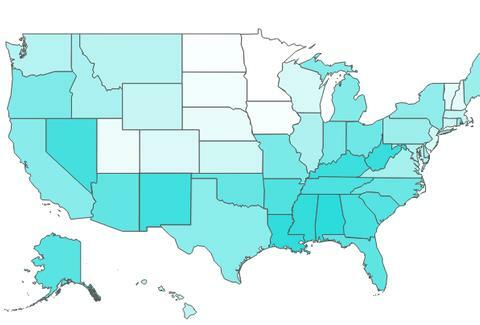 The most-stressed state in the union is Alabama, followed by Louisiana and Mississippi. WalletHub breaks down the categorical rankings that led to the overall rankings. The list includes categories like most and least hours worked per week, with Alaska topping the former and Utah the latter. Kentucky came in with the lowest job security, while the good people of Delaware are quite secure in the jobs, even if their state is smaller than average. Mississippi proved to be the state with the lowest credit scores, while North Dakota and Minnesota topped the other end of the spectrum. Mississippi also has the largest percentage of the state's population living below the poverty line, while New Hampshire sits at the other end of that category. Other key stats include divorce rate, access to affordable housing, the percentage of adults in fair to poor health, crime rate, psychologists per capita, and average hours of sleep per night. While there isn't a way to put together a conclusive list of which states experience the least stress, these categories provide interesting insight into the quality of life in different states (or at least some nonsensical bragging rights to lord over your friend from Alabama). Below, find a full ranking of the nation's 50 states from most to least stressed, according to WalletHub. Check out their study for more details and category breakdowns.